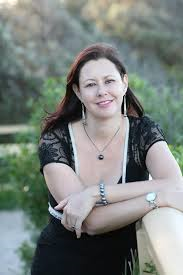 Today I’m over the moon to welcome Australian author Kate Forsyth to the blog. 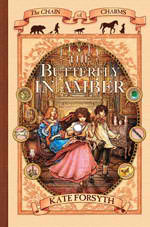 Kate is well known for her children’s fantasy books and also writes adult fantasy and historical fiction. Her most recent novels are Bitter Greens and The Wild Girl. 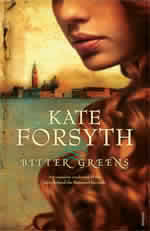 Bitter Greens is a retelling of the Rapunzel fairy tale interwoven with the dramatic life story of the woman who first told the tale, the 17th century French writer, Charlotte-Rose de la Force. Bitter Greens has been called ‘the best fairy tale retelling since Angela Carter, and has been nominated for a Norma K. Hemming Award, the Aurealis Award for Best Fantasy Fiction, and a Ditmar Award. 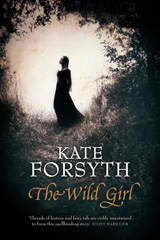 I’m currently reading The Wild Girl and loving it. It’s based on Kate’s research into the Grimm Fairy tales and tells the true, untold love story of Wilhelm Grimm and Dortchen Wild, the young woman who told him many of the world’s most famous fairy tales. Set during the Napoleonic Wars, The Wild Girl is a story of love, war, heartbreak, and the redemptive power of storytelling. Kate’s books have been published in 14 countries around the world, including the UK, the US, Russia, Germany, Japan, Turkey, Spain, Italy, Poland and Slovenia. As you’ll see from Kate’s interview below she is an extremely disciplined writer which accounts for her current total of 26 books. She is a wonderful story teller and if you ever get the opportunity to see her speak definitely take it up. Thanks for being my guest on Flying Pony, Kate! I’m an avid reader, and find inspiration for stories in many different types of books. I also love my garden, and find time spent among my herbs and flowers very restorative for the soul. I am a keen cook, and it makes me happy to create delicious feasts for people I love. I walk every day, and think through what I plan to write that day, plus I love to dance, swim in the ocean, listen to music and go to the ballet. I am highly focused, highly disciplined, and as regular as a monk in my writing vocation. When I’m at home (ie not touring or away at festivals and conferences), I have a cup of tea in bed and write in my journal, then I get up, and read book blogs and the twitter feed while I have my breakfast. I then do as much housework as I can before taking my daughter to school. I walk for an hour, and am at my computer by 10am, with another cup of tea. I answer important emails and flag others for my attention later, then I open my novel file and read through what I wrote the previous day, cutting and adding, editing and polishing as I go. I then settle in for a couple of hours intense work pushing the story forward. I jot down any questions or problems I encounter in my notebook to be answered later. I stop at around 12.30pm for lunch, and read something book-related – a blog post, a newspaper article, a book on writing. I normally hang out a load of washing and put another one, and I’ll quickly check my emails before again settling down to work. Again I’ll work for about two hours, having a small break at around 3.30-4pm when my kids get home from school. Once I’ve heard all their news, I go back to work and work steadily through till 5.30-6pm, when I normally stop and start thinking about what to cook for dinner. Two days a week, my daughter has gymnastics and doesn’t get home till 8pm, so I normally work through to 7.30pm on those days. After dinner and the kids’ bedtime (around 8.30pm-9.30pm), I will – if the book is in its early stages – go to bed and read. I may be reading for research, or for my academic studies, or I’ll be reading for pleasure. However, if I’m getting towards the end of a novel and in the grip of obsession, I will go back to my computer and write for another couple of hours. Sometimes I stay writing till long after midnight, and I will often, in the final stages of the book, also wake very early and write in the quiet and dark of the sleeping house. I’ve been known to write for 10-12 hours a day when nearing the end of a novel. After the book is finished, I generally collapse in a heap for a week or two, before starting the process all over again. It depends what you mean by writer’s block. Most people think of writer’s block as that terrible paralysis that overcomes some writers, so that they cannot write at all. Other people think of it as a lack of ideas, a lack of a story to tell. If this is what you mean, then the answer is no. I am constantly brimming over with ideas, and I always want to write. Writing is one of the primary sources of joy in my life, and as natural and essential to me as breathing. If, however, you mean – do I ever get stuck while working on a novel? Then the answer is yes, of course. Usually it means I don’t know enough – about the story, the world, my characters – and so I need to go and do some more research, or go back to my notebooks, or spend more time thinking and daydreaming and solving whatever problem I’ve encountered. Usually I’ll sleep on the problem and trust my subconscious mind to throw up the solution. I’ll think about it all the time I’m busy doing different things – washing up, driving my daughter home from ballet, walking the dog. If I still can’t find the solution, I’ll try and jolt my subconscious by listening to music, reading poetry, browsing the internet, playing word games, asking myself questions and answering them, opening books at random and seeing what my eye falls upon, or going for a very long, swift walk, thinking, thinking, thinking. The answer has always come, sometimes in the most astonishing serendipitous way, and I have learned to trust in that, and wait for it, keeping my mind open to the world. I love the first flash of an idea, which shakes me from head to foot. I love buying a new notebook with all its blank pages so full of potential. I love the early daydreaming and pondering and playing with ideas, and the way the story slowly comes to life in my imagination. I love finding my first line, my first scene … I cannot write till I have these clear in my mind’s eye. I love writing the novel, and overcoming all the obstacles in my way, and learning something new about the art and the craft of writing with every new book. It gives me immense satisfaction to see the novel slowly grow. I love the golden glow of writing that flows, the way it tingles in my fingertips and shivers along my nerves. I love the way the story fights me sometimes, and I have to struggle to conquer it. I love the giddy relief of reaching the end, and then I love the slow painstaking deconstruction of the novel, the cutting and polishing and putting together of all the cogs and wheels so the story engine races along, powerful and sure. I love nearly every aspect of the job. I’m not particularly fond of proofreading, because I have read the novel so many times by then it feels stale and jaded to me. And I get anxious when the novel is first published. I so want everyone to love my new baby, and I’m afraid the world will be cruel. Sometimes I’m hurt by a review, or a careless comment on a social media site, but I try hard not to be unbalanced by such things or to brood on them too long. It’s hard, though. Every book I have ever read has influenced me in some way. If I love the book, I read it many times and I try and understand what the writer has done to affect me so. If I don’t like it, I think about the reasons why and then try not to do that in my own writing. As I have read an average of five books a week since I first learnt to read at the age of four, I have read around 10,000 books so I’ll not try to list them all here. On my website, however, I do have a list of my favourite authors and I am always adding more. Each book is so very different, and its always difficult to explain one’s creative process. I’ll do my best, however! I usually begin with a story idea. With my novel ‘The Puzzle Ring’, this first idea came to me while I was idly reading a jewellery catalogue and read an article about the making of the first puzzle ring. I have always been drawn to mysteries and puzzles and so I was intrigued by a ring that fell apart into four separate loops, and could not be put back together unless you knew the secret sequence of movements. I thought to myself what a wonderful thematic structure such a ring could give to a quest story – a journey to find the four separate loops of the rings and put them back together again. But who would want to find the ring, and why? Where and when would such a story be set? By mulling over these questions, and playing with different ideas, I began to see the story. I slowly assemble my cast of characters and think of possible adventures for them. Stray images come to me and seem to belong to the story. In ‘The Puzzle Ring’, an important early image was that of a toad hopping out of a pool and dropping a ring at the feet of my heroine. I didn’t know how the toad had got the ring, or what role the toad played in the story until almost at the end of my first draft when suddenly the answer was revealed to me in a flash and I thought, ‘of course!’ It was as if I was discovering a story that had already been written, or already existed in some way, and only my own blindness had stopped me from seeing the truth earlier. Sometimes a story squats in my back brain for a long time, glowering at me, occasionally nudging me, waiting for the right time to be born. I have books that I first thought of when I was a child, among them ‘Bitter Greens’. I first tried to write a Rapunzel retelling when I was about 11 or 12 – I only wrote a page or so and then put it aside. I never forgot the idea, however, thinking about it many times over the years until the time seemed right. Again, I begin by asking myself questions. The Five Ws (Who, What, Where, When & Why) are the simplest and most effective planning tool and is always how I begin. For example, why did the witch lock the maiden in the tower? Why was the girl’s hair so long? Why didn’t she just cut it all off and use it to escape? I formulate answers to these questions, and I read and research and think and daydream and scribble notes to myself and slowly build a sense of my narrative thread, tying together bright glittering beads of scenes. I worry and wonder and ponder and play, until I feel as if my head is so full of story its going to burst. Only then do I begin to write. I work at the novel systematically, building it sentence by sentence, scene by scene, section by section, constantly rewriting, reshaping, rethinking my ideas. Sometimes the writing comes swiftly, sometimes it is painstakingly slow, but it steadfastly grows and gains shape, and that gives me great satisfaction. When I have a complete first draft, I look at the novel in totality and then set myself to trying to make it better. I cut it very hard, often by as much as a third, and I look at my dialogue, my chapter beginnings and endings, my use of adjectives and adverbs (I always over-use these), plus repetitions of favourite words (heart, mouth, shadowy, sombre, stagger, leap, and so on). I read the opening lines out loud, I check my facts, and I try and make sure all the disparate parts of the novel work together smoothly, sinuously, with a sense of inevitability. When the book is as good as I can get it, at that point in time, I send it to my agents and publishers, and then wait, with an acute anxiety mixed with eagerness, for their feedback. By the time I get my editorial report, I have had time to think of things I’m not happy with, that I think I could do better, and I also have a greater degree of emotionally detachment from the book. I always love the editorial process, working with people I trust to make the book as best it can be. Well, I wrote my first novel at seven and gave it a publication page with a copyright sign next to my name and the words ‘London-New York-Sydney’ so I had my heart set on publication right from the very beginning. I first sent out a manuscript at the age of 16 and, although it was rejected, I received a very encouraging letter from the publishers. All through my 20s, I sent out poems, articles, short stories, and novel manuscripts. Some were accepted; most were not. My novel – which I’d been working on since I was 16 – was almost published a couple of times and was long-listed for the Vogel Award, but didn’t make the shortlist. At the age of 25, I quit fulltime work and freelanced, writing articles for newspapers and magazines, and sub-editing corporate brochures, while I studied a MA in Writing and worked on a new novel in my university holidays. I sent the opening chapters to an agent, who told me she loved the book and could definitely sell it. I worked like a maniac to get a complete draft to her and then she took it out to publishers. After a bidding war, I signed a multiple book contract with Australian, US, German and Russian publishers. It was all very exciting. I was transformed, practically overnight, from an impoverished university student to an internationally published author. I’ve been lucky enough to sell well, and so have been a full-time writer ever since. I always say you must be brave. Not only by facing up to the hurt of rejection and criticism, but also in your writing. The longing to be published can stop a writer from taking risks, both with the actual writing and with the storyline. Then I say you must have faith, both in yourself and your story. Then, I say, be patient. A novel is a big and intricate mechanism, and it takes time both to create it properly and to publish it properly. Too many people try and publish work that’s simply not ready, and then are bitterly disappointed and give up. It’s a shame because their work had potential, but they rushed it and wrecked it. Brilliant interview1 I loved this additional insight into Kate Forsyth’s writing, impressive and inspiring for any writer. Delicious background for all book-lovers and fans of her work. Thank you. Wow! I’m exhausted just reading about your day. But I am also saving this and reading it every morning to make myself as disciplined (ie get myself of Facebook!!) Thx so much for this interview.